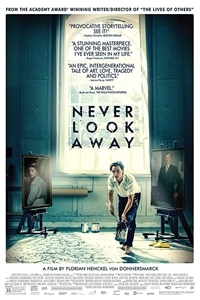 Inspired by real events and spanning three eras of German history, NEVER LOOK AWAY tells the story of a young art student, Kurt (Tom Schilling) who falls in love with fellow student, Ellie (Paula Beer). Ellie's father, Professor Seeband (Sebastian Koch), a famous doctor, is dismayed at his daughter's choice of boyfriend, and vows to destroy the relationship. What neither of them knows is that their lives are already connected through a terrible crime Seeband committed decades ago.